Last Friday, the morning of Donald Trump’s presidential inauguration, there was one healing salve: the image of Connor, a scrappy young hell-raiser straight out of a Norman Rockwell painting, who was so pissed off at the state of things that he was forced to create a fire, such that the destruction in the world might match the boiling rage within his heart. When asked by the newsman why he did so, Connor replied, “Because I felt like it, and because I’m just saying… Screw our president!” He then sort of Hulked at the camera and disappeared into the rabble, presumably to help topple a car, distribute uncompromising hard-left pamphlets, punch a sitting U.S. Senator, and create abrasive postindustrial mixtapes using copyrighted material. Also, at one point the newsman called him Carter, which Connor did not for a second accept. “It’s Connor,” he said, waiting for the bumbling incompetent to correct himself. 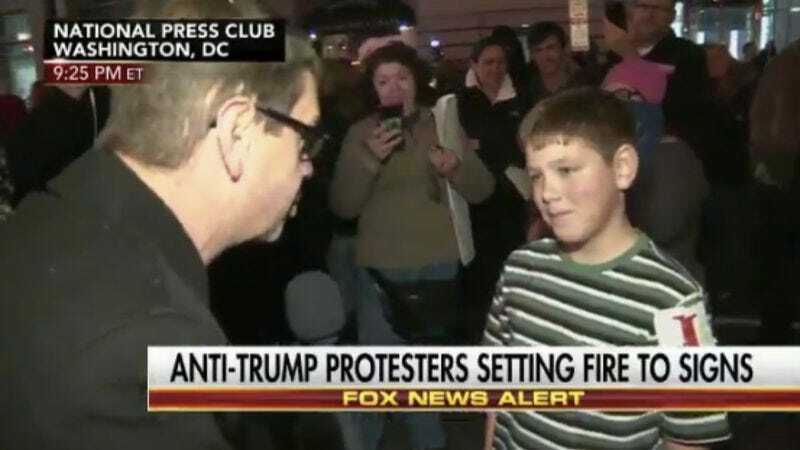 Now TMZ has reported that Connor is in fact the son of comedian Drew Carey, who was nearby but not exactly keeping an eye on his little hell-raiser at the moment. He was down the street having dinner at the time and has since talked to him about his crude yet effective choice of words. Over the years, Carey has said of Connor, “He’s the best thing in my life,” and credited him with his drastic 70-pound weight loss in 2010. Connor has now likewise inspired the American people to “lose the weight” of totalitarianism, to take to the streets as able and to disrupt the established order, because, as he inimitably put it, 1) we want to and 2) screw our president. How much the overwhelming, life-affirming success of the following day’s Women’s Marches across the globe can be attributed to Connor’s Friday-morning call to arms is hard to say, but one thing is clear: He actually started this fire. And do not call him Carter.